Dr. Bronner's Baby Mild Liquid Soap - 2 fl. oz. This travel-size bottle of Dr. Bronner's Baby Mild liquid soap contains no fragrances, and all oils and essential oils are certified organic. Made of all-natural ingredients, Dr. Bronner's mild liquid soap is ideal for camping and travel. Quickly kill bacteria when no soap and water are available with Dr. Bronner's Organic hand sanitizer. It also freshens the air with a lavender aroma. Dr. Bronner's Organic Liquid Soap - 32 oz. Made with organic oils and all-natural ingredients, Dr. Bronner's organic liquid soap is ideal for camping because it is biodegradable and gentle on the environment. Dr. Bronner's Organic Liquid Soap - 4 oz. Same great Dr. Bronner's organic soap! Now, in a compact size ideal for travel. 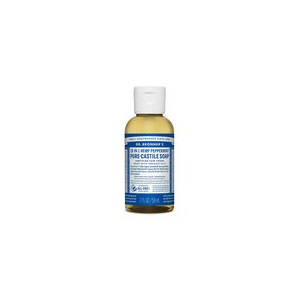 Dr. Bronner's Pure-Castile bar soap is made of all-natural ingredients and organic oils. Dr. Bronner's Travel Toothpaste - 1 oz. Keep your breath smelling fresh no matter where your travels lead with the 1 oz. Dr. Bronner's travel toothpaste, which features 70% organic ingredients and a recyclable carton, cap and tube.